Phospholipid scrambling (PLS) is a ubiquitous cellular mechanism involving the regulated bidirectional transport of phospholipids down their concentration gradient between membrane leaflets. ANO6/TMEM16F has been shown to be essential for Ca2+-dependent PLS, but controversy surrounds whether ANO6 is a phospholipid scramblase or an ion channel like other ANO/TMEM16 family members. 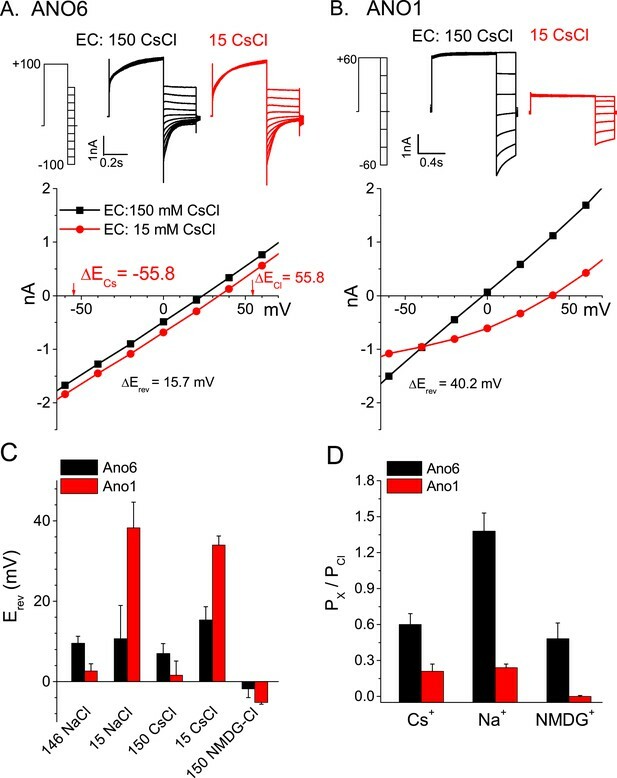 Combining patch clamp recording with measurement of PLS, we show that ANO6 elicits robust Ca2+-dependent PLS coinciding with ionic currents that are explained by ionic leak during phospholipid translocation. By analyzing ANO1-ANO6 chimeric proteins, we identify a domain in ANO6 necessary for PLS and sufficient to confer this function on ANO1, which normally does not scramble. Homology modeling shows that the scramblase domain forms an unusual hydrophilic cleft that faces the lipid bilayer and may function to facilitate translocation of phospholipid between membrane leaflets. These findings provide a mechanistic framework for understanding PLS and how ANO6 functions in this process. Cell membranes are made of two layers of molecules called phospholipids. The types of phospholipid molecules in the outer layer are often different from those in the inner layer. This asymmetry is an important feature of most membranes, but cells also have proteins called ‘scramblases’ that can move (or scramble) the phospholipids between the two layers. This scrambling process often marks a cell for destruction but also plays a key role in many activities throughout the body including cell–cell fusion, blood clotting, autoimmune diseases and inflammation. Previous research revealed that a membrane protein called ANO6 is needed for some kinds of phospholipid scrambling. Other proteins that are most closely related to ANO6 are not phospholipid scramblases; instead they are channel proteins that allow ions to pass across cell membranes. ANO6 can also allow ions to flow across membranes, which raised the question: is ANO6 actually a scramblase itself, or does it control other proteins with scramblase activity? Yu, Whitlock et al. addressed this question by engineering human cells grown in the laboratory to produce the ANO6 protein, and found that these cells had high levels of phospholipid scrambling. Next, the scrambling of phospholipids in these cells was measured while the flow of ions through ANO6 was also recorded. These experiments revealed that these two processes happened almost simultaneously. Yu, Whitlock et al. suggest that this could mean that ANO6 allows ions to leak through when it shuttles phospholipids between layers of cell membranes. ANO1 is an ion channel that is related to ANO6 but it does not have scramblase activity. By designing and testing hybrid proteins that combined parts of ANO6 and ANO1, Yu, Whitlock et al. identified the part of ANO6 that is responsible for its scramblase activity. Furthermore, computer models of this ‘scrambling domain’ suggest that it forms an unusual groove that faces into the cell membrane, and that could help phospholipids to shuttle between the inner and outer layers of the membrane. Alternatively, this groove could interact with other proteins to regulate phospholipid scrambling; and if so, further work will be needed to identify these unknown proteins. Finally, swapping a relatively small number of features between ANO6 and ANO1 could confer scrambling activity on ANO1. This suggests that ANO1 may itself have a special relationship to membrane phospholipids. Uncovering the nature of this relationship, if it exists, as well as understanding how ANO6 scrambles phospholipids will challenge structural biologists to generate high-resolution images of these proteins in complex with phospholipids. The transbilayer asymmetric distribution of phospholipids in cell membranes is evolutionarily conserved and essential to cellular physiology. In eukaryotic plasma membranes, the outer leaflet is enriched in phosphatidylcholine and sphingomyelin and the inner cytoplasmic-facing leaflet is rich in phosphatidylserine (PtdSer) and phosphatidylethanolamine (PtdEtn) (Bretscher, 1972; Fadeel and Xue, 2009; Lhermusier et al., 2011; van Meer, 2011). This asymmetry is established by ATP-dependent lipid flippases, most notably members of the P4 ATPase family (Panatala et al., 2015) and ABC transporters (Borst et al., 2000), that actively transport phospholipids to one leaflet of the membrane and are important in membrane biogenesis. Phospholipid asymmetry plays critical roles in membrane function in two ways. (1) Charges on the phospholipid head groups bind and regulate protein function. The best known examples may be the effects of phosphatidylinositol bisphosphate on ion channel proteins (Suh and Hille, 2008), but PtdSer and PtdEtn play equally important roles (Fairn et al., 2011; Jeong and Conboy, 2011; Kay and Grinstein, 2013; Hosseini et al., 2014). (2) The different molecular shapes (e.g., cylindrical or conical) of various lipids determine membrane curvature which is key to membrane trafficking and fusion (Graham and Kozlov, 2010; Bigay and Antonny, 2012; Xu et al., 2013; Suetsugu et al., 2014). In opposition to ATP-dependent flippases, ATP-independent phospholipid scramblases (PLSases) facilitate the equilibration of phospholipid distribution between the two membrane leaflets. PLSases play essential roles in the synthesis of glycoconjugates, such as N-glycosylated proteins and GPI-anchored proteins in the endoplasmic reticulum (Pomorski and Menon, 2006). Moreover, at the plasma membrane dissipation of phospholipid asymmetry by phospholipid scrambling (PLS) is a common cell signaling mechanism (Fadeel and Xue, 2009; Bevers and Williamson, 2010). For example, exposure of PtdSer on the external leaflet of the plasma membrane marks apoptotic cells for phagocytosis by macrophages and plays a key role in blood clotting (Fadok et al., 1992; Verhoven et al., 1995; Emoto et al., 1997; Fadok et al., 2001; Suzuki et al., 2010; Lhermusier et al., 2011; Kay and Grinstein, 2013). PtdSer exposure that occurs when platelets sense tissue damage serves as a catalytic surface for assembly of plasma-borne coagulation factors and a >106-fold increase in the rate of thrombin formation (Zwaal et al., 1998; Sahu et al., 2007; Kay et al., 2012). PtdSer exposure also plays important roles in developmental processes that involve fusion of mononucleated progenitor cells to form multinucleated cells such as skeletal muscle (Jeong and Conboy, 2011; Hochreiter-Hufford et al., 2013), osteoclasts (Pajcini et al., 2008; Helming and Gordon, 2009; Harre et al., 2012; Shin et al., 2014; Verma et al., 2014) and placental syncytiotrophoblasts (Huppertz et al., 2006; Riddell et al., 2013). In the simplest conceptualization, PLS is mediated by PLSases that are thought to provide, in a manner analogous to ion channels, an aqueous pathway for the hydrophilic phospholipid head groups to flip between the inner and outer leaflets (Pomorski and Menon, 2006; Sanyal and Menon, 2009). However, the molecular mechanisms of PLS have remained elusive partly because PLS can be catalyzed by a variety of unrelated proteins. PLS is stimulated by two pathways, a rapid one triggered by increases in intracellular [Ca2+] and a slow caspase-dependent pathway associated with apoptosis (Schoenwaelder et al., 2009). At least four different families of proteins have been implicated in PLS (Sahu et al., 2007; Bevers and Williamson, 2010; Lhermusier et al., 2011). The first putative PLSases (PLSCR1–PLSCR4) were identified by their ability to stimulate Ca2+-dependent PtdSer scrambling when incorporated into liposomes (Basse et al., 1996; Comfurius et al., 1996), but the role of PLSCRs in PLS is controversial because these proteins are small calmodulin-like molecules whose disruption in mice, flies, and worms has little effect on PLS (Acharya et al., 2006; Fadeel and Xue, 2009; Bevers and Williamson, 2010; Ory et al., 2013). More recently, the Xk-family protein Xkr8 has been shown to be necessary for caspase-dependent PtdSer scrambling that can be rescued by multiple Xkr8 paralogs (Suzuki et al., 2013a, 2014). Unexpectedly, several G-protein coupled receptors including rhodopsin and the β-adrenergic receptor have also been shown to elicit PLS (Goren et al., 2014). Although lipid-translocating ABC transporters and phospholipid synthesis may also play roles in PLS, these processes cannot fully explain PLS (Fadeel and Xue, 2009; Goren et al., 2014). Recently, it has been suggested that some members of the 10-gene Anoctamin (TMEM16) family are PLSases. Evidence supporting a role for ANO6 in PLS includes the findings that (a) mutations in ANO6 produce Scott Syndrome, a blood clotting disorder where platelets fail to expose PtdSer in response to cytosolic Ca2+ increases (Suzuki et al., 2010; Yang et al., 2012; Kmit et al., 2013), (b) knockout of ANO6 in mice abolishes the ability of cells to expose PtdSer and to scramble other lipid species in response to elevated cytosolic Ca2+ while PLS stimulated by the apoptotic Fas receptor is unaffected (Suzuki et al., 2010), and (c) over-expression of ANO6 in knockout cells rescues PLS (Suzuki et al., 2013b). 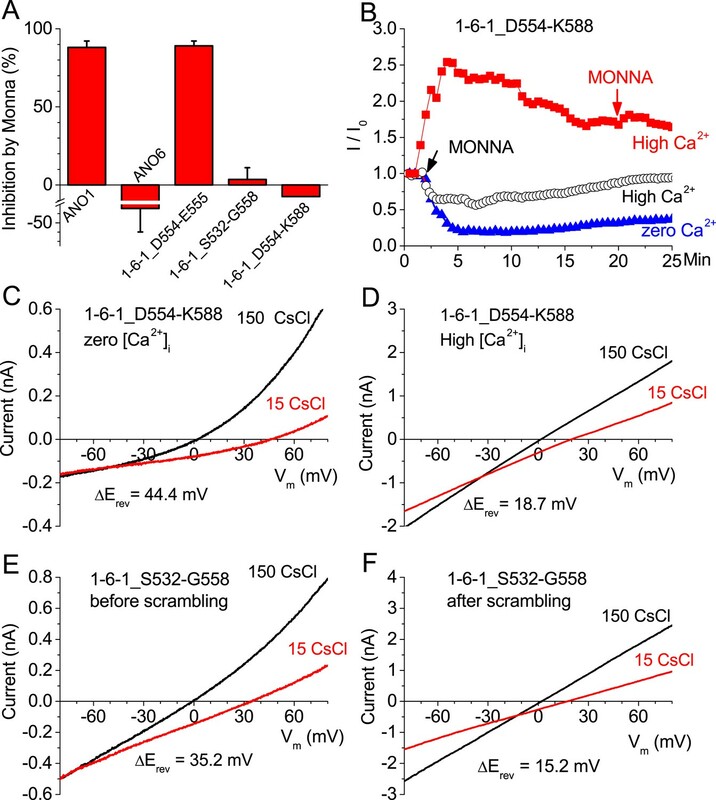 However, the suggestion that ANO6 is a PLSase is confounded by the fact that other members of the anoctamin family, ANO1 and ANO2, encode the pore-forming subunits of Ca2+-activated Cl− channels (CaCCs) (Caputo et al., 2008; Schroeder et al., 2008; Yang et al., 2008; Hartzell et al., 2009; Duran and Hartzell, 2011; Pedemonte and Galietta, 2014; Ruppersburg and Hartzell, 2014). It was initially presumed that all ANOs are Cl− channels because of the close sequence similarity between ANO family members (ANO1 is 38–45% identical to ANOs −3 to −7, >90% coverage), however, the requirement of ANO6 for Ca2+-dependent PLS and the ability of ANOs 3, 4, 6, 7, and 9 to rescue this activity suggests functional divergence within the ANO family (Suzuki et al., 2010, 2013b). Questions remain whether ANO6 is a PLSase itself and/or is an ion channel that regulates PLSase activity (Kunzelmann et al., 2014; Pedemonte and Galietta, 2014; Picollo et al., 2015). ANO6 has been reported to be a non-selective cation channel (Yang et al., 2011; Adomaviciene et al., 2013), a swelling-activated Cl− channel (Almaca et al., 2009), an outwardly-rectifying Cl− channel (Martins et al., 2011), a CaCC (Szteyn et al., 2012; Shimizu et al., 2013; Juul et al., 2014), and a CaCC of delayed activation (Grubb et al., 2013). Furthermore, in contrast to Suzuki et al. (2010), Yang et al. (2012) conclude that ANO6 is a regulator of an endogenous PLSase because they find that expression of ANO6 in HEK cells does not cause PtdSer exposure. However, the suggestion that some ANOs are PLSases and are not simply regulators of endogenous PLSases is supported by recent reports that two fungal ANO homologs purified and incorporated into liposomes mediate Ca2+-stimulated PLS (Malvezzi et al., 2013; Brunner et al., 2014). Here we address three questions. (1) Does expression of ANO6 stimulate Ca2+-dependent PLS in HEK cells? We find that ANO6 expression in HEK cells induces robust Ca2+-activated scramblase activity. (2) Is the ion channel activity of ANO6 related to PLS? We find that ANO6 currents are non-selective among ions and are activated simultaneously with PLS. This suggests that ionic currents are a consequence of phospholipid translocation. Chimeric constructs that exhibit PLS also exhibit simultaneous non-selective currents. Furthermore, we find that drugs that block ANO1 currents do not block ANO6 currents or PLS. This is consistent with the idea that the ion conduction pathway associated with ANO6 is unlike the ANO1 pore. (3) What are the domains of ANO6 that are required for PLS? We find that mutating several amino acids in ANO6 between TMD4 and TMD5 eliminates both PLS and ion channel activity. Furthermore, replacing as few as 15 amino acids in ANO1 in the TMD4-TMD5 region with ANO6 sequence confers robust PLS activity on ANO1, which normally does not elicit PLS activity. We first asked whether ANO6 when expressed heterologously induced PLS in HEK293 cells. Ca2+-dependent PtdSer exposure on the outer leaflet of the plasma membrane was measured by confocal imaging of two PtdSer probes, either LactoglobulinC2 fused to Clover fluorescent protein (‘LactC2’) or Annexin-V conjugated to AlexaFluor-568 (‘Annexin-V’) (Shi et al., 2006; Hou et al., 2011; Kay and Grinstein, 2011). Our initial experiments employed LactC2 with a clonal cell line stably transfected with mANO6-FLAG3X. 100% of the cells express ANO6-FLAG3X as shown by staining with anti-FLAG antibody (Figure 1A). Intracellular Ca2+ was elevated by incubation of the cells in 10 µM A23187 in nominally zero Ca2+ solution followed by washout of A23187 and addition of 5 mM Ca2+ to initiate Ca2+-dependent PLS. 12 min after adding Ca2+, ∼92% of the cells (N = 404) showed LactC2 binding to the surface (Figure 1B,G). In contrast, little or no LactC2 binding was seen in the parental cell line (0.2% positive cells, N = 724) or in ANO1-FLAG3X-expressing cells (8% positive cells, N = 316) (Figure 1C,D,G). The difference in PLS observed with ANO1 and ANO6 expressing cells was not explained by differences in expression as shown by western blot (Figure 1F). These data show clearly that ANO6 expression facilitates PLS. However, the finding that a small fraction (8%) of ANO6-FLAG3X expressing cells do not exhibit PLS raises the possibility that ANO6 may not be sufficient for PLS and may require additional components. Expression of ANO6 in HEK cells stimulates Ca2+-dependent phospholipid scrambling (PLS). (A) Images of HEK cells stably transfected with ANO6-FLAG3X fixed and stained with anti-FLAG (green) and phalloidin (magenta). (B–D) Images of live cells after exposure to 10 μM A23187 in zero-Ca2+ solution for 5 min followed by solution containing 5 mM Ca2+ and 3 µg/ml LactC2-Clover for 12 min as described in ‘Materials and methods’. Green channel: LactC2-Clover. DIC channel: differential interference contrast. (B) HEK cells stably expressing ANO6-FLAG3X. (C) Parental HEK cells not expressing ANO6. (D) HEK cells stably transfected with ANO1-FLAG3X. (E) A23187 in zero Ca2+ does not stimulate LactC2 binding. The first two panels show LactC2-Clover binding in cells incubated in A23187 in zero Ca2+ containing LactC2 for 15 min. The second two panels show the same cells 10 min after adding 5 mM Ca2+. (F) Level of expression of ANO1 and ANO6 in stably expressing HEK cells. Extracts of cells in B–D were immunoblotted with anti-FLAG and anti-GAPDH to quantify protein expression. (G) Numbers of cells binding Annexin-V (‘scrambled’) or not binding Annexin-V (‘not scrambled’) for parental HEK cells, ANO6-FLAG3X, and ANO1-FLAG3X expressing cells. (H) Time course of Annexin-V and LactC2 binding to HEK cells expressing ANO6-FLAG3X. Images of the same field of 30–100 cells were acquired at ∼20 s intervals. Annexin-V: mean ± SEM of seven independent experiments, LactC2: mean ± SEM of five independent experiments. Means at the end of the recordings were normalized to 1. Scale bars = 20 μm. An advantage of LactC2 is that it does not require Ca2+ to bind PtdSer (Shi et al., 2006; Kay and Grinstein, 2011), so we were able to use it to test whether ANO6-elicited PtdSer exposure requires Ca2+. 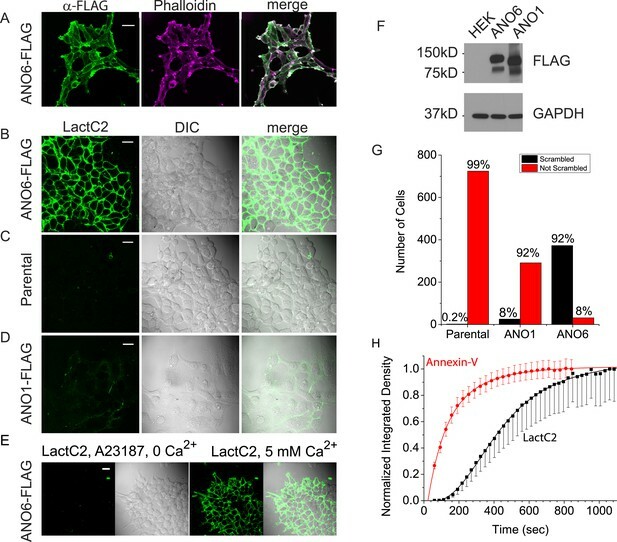 ANO6-FLAG3X cells exposed to A23187 without addition of Ca2+ exhibited no detectible LactC2 binding over 15 min, whereas subsequent addition of Ca2+ stimulated robust LactC2 binding (Figure 1E). Next, we compared LactC2 and Annexin-V as probes for PLS. The percentage of cells stained with Annexin-V and LactC2 were the same, however, the kinetics of binding of the two probes were markedly different. After elevating cytosolic Ca2+, Annexin-V fluorescence increased mono-exponentially with a mean τ = 143 s (7 separate experiments, χ2 of fit = 0.03) and approached a plateau within less than 10 min (Figure 1H). In contrast, the time course of LactC2 binding was significantly slower (5 separate experiments, τ = 433 s, χ2 of fit = 0.02). LactC2 binding exhibited a lag period of 1–2 min before binding was detectable. One potential explanation of the difference in Annexin-V and LactC2 time courses may be related to the fact that LactC2 prefers binding to oxidized PtdSer (Tyurin et al., 2008). Because Annexin-V binds with more rapid kinetics, the rest of the experiments shown here were performed using Annexin-V.
Because all of the cells in the clonal cell line express ANO6-FLAG3X at about the same level, we turned to a polyclonal cell line stably expressing ANO6-EGFP to evaluate the relationship of ANO6 expression to the rate and extent of Annexin-V binding (Figure 2). In the polyclonal line, ANO6-EGFP expression level was variable and 85% of ANO6-EGFP cells exhibited PLS (N = 180). This percentage may be lower than the ANO6-FLAG3X clonal line because some ANO6-EGFP positive cells may have lower expression than the ANO6-FLAG3X cells. There was a direct relationship between the level of ANO6-EGFP expression and the level of Annexin-V binding 10 min after elevating cytosolic Ca2+ (Pearson correlation coefficient = 0.84) (Figure 2C), however there was considerable variation around the fitted relationship, with some highly-expressing ANO6 cells showing little Annexin-V binding and low-expressing cells showing high levels of binding. The rate of Annexin-V binding was similar among cells (τ in this experiment ranged from 152–229 s), but the plateau level of Annexin-V binding attained after 12 min varied markedly among cells. Neither the rate nor the plateau level of binding correlated with the level of ANO6-EGFP fluorescence. 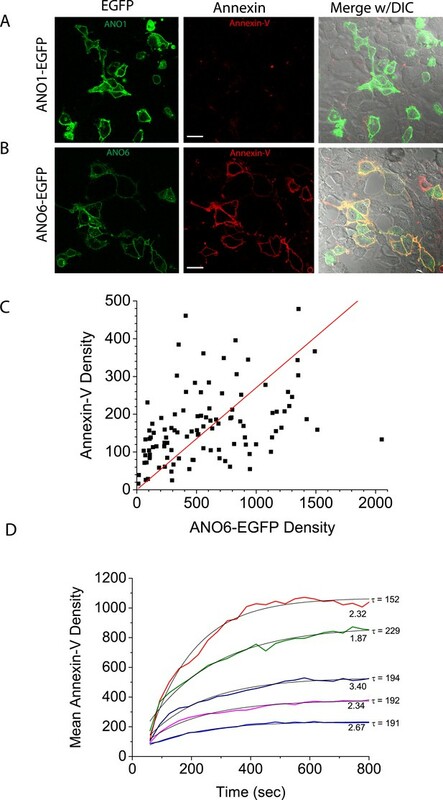 This lack of correlation may reflect an inability to distinguish between ANO6-EGFP located on vs adjacent to the plasma membrane or may reflect heterogeneity in the expression of other components required for PLS. Characteristics of PLS linked to ANO6. Intracellular Ca2+ was elevated by A23187, as in Figure 1, in polyclonal lines of HEK cells expressing (A) ANO1-EGFP or (B) ANO6-EGFP. (C) The relationship between ANO6-EGFP expression (mean EGFP pixel density of each cell) and AnnexinV-Alexa568 binding (mean pixel density in the Annexin-V channel masked by the EGFP channel). The line is the best fit to a straight line with Pearson's correlation coefficient r = 0.84. (D) Examples of the time course of Annexin-V binding to five individual cells in a typical experiment. The numbers at the end of the trace represent the relative EGFP density of the cell and τ is the time constant of a mono-exponential fit (light black line) of the data. The next question that we sought to answer was whether the ionic current that has been associated with ANO6 (Almaca et al., 2009; Martins et al., 2011; Yang et al., 2011; Szteyn et al., 2012; Grubb et al., 2013; Harper and Poole, 2013; Shimizu et al., 2013; Juul et al., 2014) is linked to PLS or is an independent function of the protein. We patch-clamped HEK cells transiently expressing ANO6-EGFP and recorded ANO6 currents while simultaneously imaging Annexin-V binding. A typical experiment is shown in Figure 3A with average results in Figure 3B,C. After establishing whole-cell recording, the time course of activation of membrane currents in ANO6-expressing cells was very slow even when the patch pipet solution contained high (200 μM) Ca2+. The currents typically began to increase 8 min after initiating whole cell recording, which is similar to that reported by others (Grubb et al., 2013). Annexin-V binding usually became detectable 2–3 min later (Figure 3B,C). The time courses of ANO6 current activation and Annexin-V binding were fit to the equation y = A2 + (A1 − A2)/1 + exp[(t − t0)/τ]. Although the time constants of the increases in Annexin-V binding (τ = 2.24 ± 0.15 min) and ANO6 current (τ = 2.31 ± 0.34 min) were the same, the time (t0) at which Annexin-V fluorescence reached half of its maximal value [(A1 + A2)/2] was delayed 3 min relative to the current. 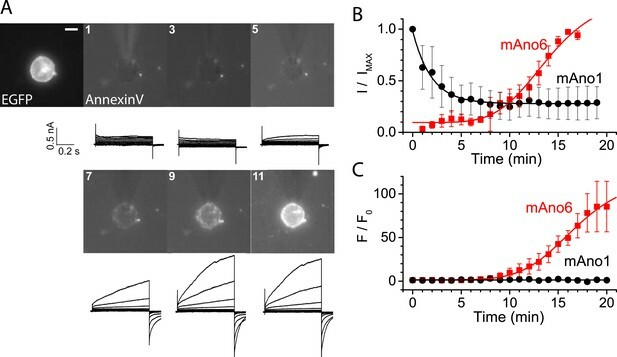 In contrast to ANO6, ANO1 currents activated quickly after initiating whole-cell recording and then ran down with time (Figure 3B), as previously reported (Yu et al., 2014) and no Annexin-V binding was observed. ANO6 current activates coincidently with PLS. HEK cells transiently expressing ANO6-EGFP were patch clamped in the presence of Annexin-V-Alexa-568 in the bath. The EGFP fluorescence image was obtained before establishing whole-cell recording and Fo was determined immediately after establishing whole-cell recording. Annexin-V fluorescence images were acquired immediately after obtaining each I-V curve by voltage clamp at 1 min intervals. The patch pipet contained 200 μM free Ca2+. I-V curves were obtained by voltage steps from −100 mV to +100 mV in 20 mV increments. (A) Representative images and currents of one of 20 experiments. The first image shows ANO6-EGFP fluorescence. The patch pipet can be seen entering the field from 12 o'clock. Scale bar 10 µm. (B) Average current amplitudes normalized to maximum current for cells expressing ANO6 (red square) or ANO1 (black circles) plotted vs time after establishing whole-cell recording. (C) Average Annexin-V fluorescence normalized to maximum fluorescence for the same cells as in B (n = 6). There are two explanations for the lag between ANO6 current activation and Annexin-V binding. One possibility is that current is required for PLS. However, we believe that the lag is partly explained by inherent differences in way the two events are measured. Patch clamp recording measures membrane conductance instantaneously, while detection of Annexin-V fluorescence requires the accumulation of Annexin-V on the membrane that is limited by its binding kinetics and the sensitivity of the fluorescence detection. Because Annexin binding to model bilayers is known to be slow and requires a threshold PtdSer concentration (Kastl et al., 2002; Shi et al., 2006) and the numerical aperture of the microscope objective was 0.6, we believe that currents and PLS occur contemporaneously. This correlation suggested the possibility that currents reflect transmembrane ion leakage associated with the process of phospholipid transport. The alternative hypothesis that ionic current through ANO6 somehow activates PLS is excluded by the finding that PLS occurs normally in ANO6-expressing cells under conditions where there is no ionic current (e.g., cells voltage-clamped at 0 mV with identical intracellular and extracellular solutions where Erev for every ion is 0 mV). If ANO6 current is a consequence of PLS and not a separate function of the protein, we would expect that current and PLS would require the same Ca2+ concentration for activation. Activation of ANO6 current requires >20 μM free Cai2+ and requires minutes to develop (Figure 4A,B). With 20 μM Ca2+, neither PLS nor currents are observed even after 20 min of recording. Currents and PLS are consistently observed only with 200 μM Ca2+. Although this finding does not exclude the possibility that ion conductance and PLS are separate functions of ANO6, it is consistent with the two functions being linked. Activation of ANO6 current and PLS requires high intracellular Ca2+ concentrations. (A) Average current–voltage relationships of currents recorded ∼20 min after establishing whole-cell recording in Ano6-expressing cells patched with 20 μM (black squares, N = 6) or 200 μM Ca2+ (red circles, N = 10) in the patch pipet. (B) Annexin-V binding in Ano6-expressing cells patched with 20 μM (black squares, N = 5) and 200 μM (red circles, N = 15) Ca2+ in the patch pipet. Error bars are S.E.M. If one accepts the proposal that ANO6 currents and Annexin-V binding occur simultaneously, this suggests that ANO6 currents may represent the flux of ions through micro-disruptions of the lipid membrane occurring during PLS rather than ions flowing through a defined aqueous pore defined by ANO6 protein. If ANO6 currents are a consequence of PLS, we would predict that their ionic selectivity would be very low. To explore the idea that ANO6 currents are essentially leak currents, we examined the ionic selectivity of the currents appearing after PLS was activated. In comparison to ANO1 currents, which exhibit robust anion:cation selectivity (PNa/PCl = 0.03), the ANO6 current is highly non-selective (Figure 5). The ionic selectivity sequence was Na+ > Cl− > Cs+ > NMDG+ (PNa/PCl = 1.38, PCs/PCl = 0.6, PNMDG/PCl = 0.48). These data are consistent with the permeation pathway of ANO6 being relatively large and capable of passing NMDG+ which has a mean diameter of ∼7.3 Å. The finding that ANO6 currents have very low ionic selectivity and are activated contemporaneously with PLS over the same Ca2+ concentration range suggested that PLS and currents have the same underlying mechanism. Ionic selectivity of ANO6 currents. Representative whole-cell patch-clamp recordings and current–voltage relationships from (A) ANO6 and (B) ANO1 expressing cells with 200 μM [Ca2+]i. Currents were recorded in 150 mM or 15 mM extracellular CsCl. The reversal potentials (Erev) shift very little with ANO6-expressing cells, while the shift is large for ANO1-expressing cells. (C) Average Erev values for ANO6 or ANO1 expressing cells bathed in 146 NaCl, 150 CsCl, 15 NaCl, 15 CsCl, or 150 NMDG-Cl. (D) Relative permeabilities calculated from the Goldman-Hodgkin-Katz equation. N = 6–17. Because ANO1 has no scramblase activity while ANO6 does (Malvezzi et al., 2013; Terashima et al., 2013; Suzuki et al., 2013b; Brunner et al., 2014), we hypothesized that ANO6 contains a domain responsible for PLS that is absent in ANO1. We employed computational approaches to gain insights into sequence differences that could define this functional difference. We analyzed Type-I and Type-II divergence between mammalian ANO1 and ANO6 as an indication of the functional relevance of different amino acids (Gu, 2006). Sequences used for the analysis are shown in Figure 6—figure supplement 1 and an alignment of ANO6 and ANO1 is shown in Figure 6—figure supplement 2. Type I divergence occurs shortly after gene duplication and is characterized by amino acids that are highly conserved in one paralogous group of proteins and highly divergent in the other. Type II divergence occurs later when specific functions undergo positive selection within a paralogous group, resulting in conserved changes in amino acid properties. Type II divergence is exemplified by alignment positions that are identical within paralogous groups but have amino acids with radically different properties between paralogous groups. There are three major regions of Type-II divergence between ANO1 and ANO 6 (Figure 6A). These regions are located in (a) intracellular loop 1, (b) TMD4 and TMD5 and the short intracellular loop between them, and (c) the C-terminus adjacent to the last transmembrane domain. To test the functional significance of these divergent amino acids, we made chimeric constructs of ANO1 and ANO6, named X-Y-X_i-j, where ANO paralog X has its amino acids i-j replaced with aligned amino acids from ANO paralog Y. The 1-6-1 chimeras, made by replacing short segments of ANO1 sequence with ANO6 sequence, were first screened by confocal microscopy of cultures. Identification of a PLS domain in ANO6. (A) Site-specific Type II divergence scores were calculated by comparing ANO1 and ANO6 sequences from 24 mammalian species, binned over a 15-amino acid window, and normalized to the maximum value. Horizontal lines at top indicate transmembrane domains. Vertical lines indicate individual amino acids with high Type II Divergence Scores. (B) Summary of 1-6-1 chimeras. Black line represents ANO1 sequence with TMDs 2–10 labeled. Colored horizontal lines represent ANO1 sequence that was replaced with the corresponding ANO6 sequence. Numbers refer to ANO1 sequence. Green: ANO1-like currents, no scrambling. Red: scrambling. Grey: weak plasma membrane expression, but no currents or scrambling. Orange: some plasma membrane expression, no currents or scrambling. (C) Scrambling domain (SCRD). 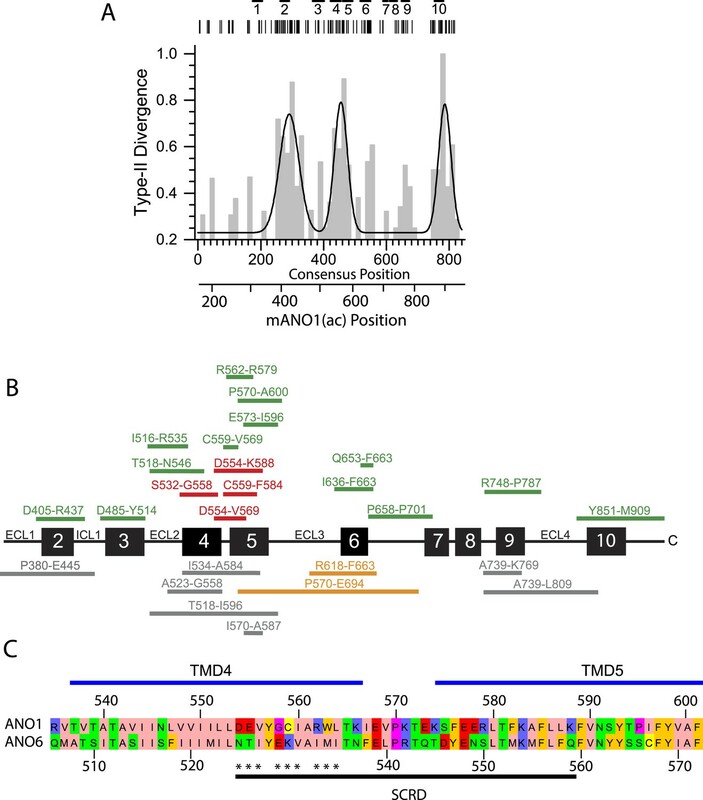 The sequences of ANO1 (535–601) and ANO6 (506–572) are aligned with TMD 4 and TMD5 indicated. Amino acids are colored according to Rasmol. SCRD shows region associated with PLS. Asterisks show amino acids that are essential for PLS in ANO6. Figure 6—figure supplement 1 lists sequence accession numbers used for Diverge analysis. Figure 6—figure supplement 2 shows alignment of mANO1 and mANO6 used for chimeric construction. Figure 6—figure supplement 3 tabulates the properties of all of the 1-6-1 chimeras. Figure 6—figure supplement 4 shows a confocal image of scrambling by the 1-6-1_(554-588) chimera. Figure 6—figure supplement 5 summarizes properties of mutations in ANO6 SCRD. Of 26 1-6-1 chimeras, 17 trafficked to the plasma membrane and generated Cl− currents in patch clamp (Figure 6B, Figure 6—figure supplement 3). 13 1-6-1 chimeras did not exhibit PLS. However, four chimeras having ANO1 sequence replaced with ANO6 sequence in the region spanning TMD4 and TMD5 showed robust PLS activity (chimeras 1-6-1_D554-K588, 1-6-1_C559-F584, 1-6-1_S532-G558, and 1-6-1_D554-V569). The 1-6-1 chimera that scrambled having the smallest ANO6 sequence (1-6-1_D554-V569) had 15 amino acids of ANO1 replaced with amino acids 525–540 from ANO6. Additional constructs were made in which only pairs or triplet amino acids in ANO1 were mutated to the divergent amino acids from ANO6, but none of these chimeras exhibited PLS activity (Figure 6—figure supplement 4). We term this region of ANO6 between amino acids 525–559, capable of conferring PLS activity on ANO1, the scrambling domain (SCRD) (Figure 6C). The ability of the SCRD to confer PLS activity on ANO1 does not necessarily prove that it is required for ANO6 PLS. To test this possibility, we mutated these amino acids in ANO6 to determine if they abolished ANO6-mediated PLS. Chimeras in which portions of the ANO6 SCRD were replaced with ANO1 sequence had greatly reduced PLS activity (Figure 6—figure supplement 5). Furthermore, mutation of several triplets of amino acids (525NTI, 529EKV, and 533IMI) between N525 and I535 abrogated ANO6 PLS activity. Chimeras that trafficked to the plasma membrane, as judged by confocal microscopy, were then subjected to patch clamp analysis to measure ionic currents generated during PLS. Figure 7A,B shows the percentage of cells that bound Annexin-V after 15 min whole cell patch clamp recording using 200 µM Ca2+ in the patch pipet and the amplitude of the ionic current at +100 mV when Annexin-V binding had plateaued (see also Figure 6—figure supplements 3–5). Chimeras that support PLS invariably had ionic currents, while 6-1-6 chimeras that do not scramble (6-1-6_N525-Q559, 6-1-6_N525-I527, 6-1-6_E529-V531, and 6-1-6_N541-T662) exhibited very small or no currents. However, the amplitudes of the currents did not correlate with the percentage of cells that exhibited PLS, possibly because of differences in surface expression, which were not controlled (Figure 7A,B). The finding that mutations in ANO6 that abolished PLS also abolish ionic currents suggests that ions and phospholipids are translocated by overlapping molecular machinery. Properties of chimeras of ANO1 and ANO6. (A, B) Patch clamp analysis of PLS (A) and ionic currents (B) in ANO1-ANO6 chimeras. Cells were patch clamped with 200 μM Ca2+ in the pipet and PLS was monitored by Annexin-V binding and currents measured by voltage steps from 0 mV to +100 mV. (C) Confocal imaging of Annexin-V binding to HEK cells transfected with the 1-6-1_D554-K588 or the 6-1-6_N525-I527 chimeras 10 min after elevating Ca2+ with A231187. (D) Number of cells binding Annexin-V (‘scrambled’) or not binding Annexin-V (‘not scrambled’) 10 min after elevation of Ca2+ with A23187 (N = 3 experiments each). (E) Time course of Annexin-V binding to cells expressing the 1-6-1_D554-K588 chimera (red) compared to the time course of Annexin binding to ANO1-expressing cells (black). To investigate the properties of the chimeras in more detail, we selected the PLS-positive chimera 1-6-1_D554-K588 and the PLS-negative chimera 6-1-6_N525-I527 for analysis. We first examined PLS in intact cells after elevation of cytosolic Ca2+with A23187. Like ANO6, 1-6-1_D554-K588 exhibited robust Annexin-V binding within 10 min (Figure 7C). In contrast, 6-1-6_N525-I527, which had three amino acids of ANO6 swapped with ANO1 sequence, did not exhibit PLS (Figure 7C). 96% of cells transfected with 1-6-1_D554-K588 (N = 178) of cells bound Annexin-V (Figure 7D). In contrast, only 15% of the cells (N = 127) transfected with 6-1-6_N525-I527 bound Annexin-V. The rate of Annexin-V binding was very similar for 1-6-1_D554-K588 and ANO6 (Figure 7E). On average, Annexin-V binding to ANO6-expressing cells occurred with τ = 143 s (Figure 2D), whereas Annexin-V binding in cells transfected with 1-6-1_D554-K588 occurred with τ = 218 s(χ2 = 0.03). Although other 1-6-1 chimeras that exhibited PLS were not investigated at the same detail, the characteristics of PLS of these chimeras were qualitatively similar to 1-6-1_D554-K588. Patch clamp analysis shows that the currents of chimeras exhibiting PLS have properties that are a hybrid of ANO1 and ANO6 (Figure 7—figure supplement 1). While no PLS and no currents were observed in cells transfected with 6-1-6_N525-I527 during 20 min using 200 µM Cai2+, in cells transfected with 1-6-1_D554-K588, robust Annexin-V binding occurred even with 20 μM Cai2+. Therefore, it seems that this chimera retains the Ca2+ sensitivity of ANO1. Moreover, the current was largest immediately upon establishing whole cell recording and then it ran down with time, similar to ANO1 currents (Figure 7—figure supplement 1). However, the rundown was not monotonic, but was interrupted by a transient increase in current. We interpret these data to indicate that this chimera initially exhibits ANO1-like currents, and that as PLS begins, the current acquires the properties of ANO6. The nature of this current is investigated below. We reasoned that if the pathway taken by ions is the same as the one taken by phospholipids, the two events might have similar pharmacology. Therefore, we tested the effects of MONNA, a small molecule that blocks ANO1 currents (Oh et al., 2013). We find that although 10 μM MONNA blocks ANO1 currents ∼90%, ANO6 currents are unaffected (Figure 8A). These data support the suggestion that the permeation pathway for Cl− in ANO1 differs from the ion conduction pathway of ANO6. Furthermore, MONNA does not block currents of 1-6-1 chimeras that exhibit PLS activity (Figure 8A). This suggests that the structural determinants of PLS in the SCRD alter that pharmacology of ANO1. Ion channel properties of ANO1-ANO6 chimeras. (A) Inhibition of currents by MONNA. ANO1 is nearly completely blocked by 10 μM MONNA, while ANO6 and the 1-6-1 chimeras that scramble are not affected. (B) Effects of MONNA on currents associated with the 1-6-1_D554-K588 chimera. MONNA blocks the Ca2+-independent current elicited by depolarization to +100 mV (blue triangles), but has no effect on the Ca2+-activated current after scrambling has occurred (red squares). In contrast, before scrambling has occurred, MONNA partially blocks the Ca2+-activated current (open circles). (C–F) The ionic selectivity of currents associated with the 1-6-1_D554-K588 chimera (C–D) and the 1-6-1_S532-G558 chimera (E, F) were determined by the dilution method (see ‘Materials and methods’) by measuring reversal potentials with external solutions containing either 150 mM (black line) or 15 mM (red line) CsCl. (C) Ca2+-independent (zero Cai2+) and (D) Ca2+-activated currents associated with the 1-6-1_S532-G558 chimera. Currents recorded (E) before and (F) after scrambling with the 1-6-1_S532-G558 chimera. N = 3–7. Error bar represents SEM. We have previously shown that ANO1 currents can be activated by strong depolarizations in the absence of Ca2+ (Xiao et al., 2011). Because ANO6 does not exhibit such Ca2+-independent currents, we asked whether we could detect Ca2+-independent ANO1-like currents in 1-6-1_D554-K588 in zero Ca2+. Like ANO1, 1-6-1_D554-K588 exhibits Ca2+-independent currents at very positive potentials and these currents are blocked by MONNA (Figure 8B, blue triangles). This current is Cl−-selective (PCs:PCl = 0.08) (Figure 8C). Thus, in zero Ca2+ 1-6-1_D554-K588 currents resemble ANO1. However, after PLS has been activated by Ca2+, the current is not blocked by MONNA (Figure 8B, red squares) and the current is >fourfold less Cl−-selective (PCs:PCl = 0.39) (Figure 8D). These data suggest that as PLS develops in response to elevated intracellular Ca2+, the ionic conductance pathway changes from Cl−-selective to non-selective. In fact, this transition between MONNA-sensitive and MONNA-insensitive currents can be seen when MONNA is applied shortly after establishing whole-cell recording with Ca2+ in the pipet (Figure 8B, black open circles). The current is initially blocked partially by MONNA, but then the current begins to increase coincidently with development of PLS. Because PLS of 1-6-1_D554-K588 develops quickly after establishing whole cell recording, it is difficult to compare the properties of the currents before and after PLS in the same cell. Therefore, we used the chimera 1-6-1_S532-G558 which activates PLS more slowly. About 5 min after establishing whole-cell recording before PLS was detectable, the current exhibited Cl−-selectivity as indicated by a 35 mV shift in Erev upon switching from 150 mM CsCl to 15 CsCl (PCs:PCl = 0.15) (Figure 8E). In contrast, after scrambling had occurred, cation permeability was significantly increased, with an ΔErev shift of only 15 mV (PCs:PCl = 0.50) (Figure 8F). We cannot formally determine whether the Cl−-selective pathway in the absence of PLS and the non-selective PLS-linked pathway are the same, but the observation that MONNA blocks the Cl−-selective pathway but has no effect on the current after PLS develops suggests that the Cl−-selective pathway is no longer present after PLS occurs. This is consistent with the Cl−-selective pathway becoming less selective during scrambling. Recently, the X-ray structure of an ANO homolog from the fungus Nectria haematococca was published (Brunner et al., 2014). This protein, nhTMEM16, exhibits PLS activity when reconstituted into liposomes. Evidence for its channel activity is lacking, although the authors indicate that the lack of channel activity might be an artifact of the purification and reconstitution conditions. To gain insights into the structure-function relationships of the SCRD to protein structure, we created a homology model of ANO6 based on nhTMEM16 (Figure 9). This model shows that the SCRD forms a unique structure. Along with helices 3, 6, and 7, it forms what Brunner et al. (Brunner et al., 2014) call the ‘subunit cavity’, a hydrophilic crevice that faces the lipid membrane on the side of the protein away from the dimer interface. Brunner et al. speculate that this region may be involved in lipid transport. (A) Side view from the membrane. ANO6 is shown as a dimer with the left subunit in gold and the right subunit in grey. The SCRD is colored red. Transmembrane helices are numbered. (B) View from extracellular side. (C) View from cytoplasm. (D) A view from the membrane looking towards the hydrophilic cleft showing the SCRD in red and the Ca2+ binding site in stick representation. Residues conserved between ANO6 and TMEM16 that coordinate Ca2+ (green) are shown as white sticks (C = white, O = red). ANO6 contains GXXX (pink), which is a D503 in TMEM16. (E) Close-up view of D. (F) Same view as D with surface colored to show hydrophilicity. Green: hydrophilic. White: hydrophobic. PLSases are conceived to function in a fashion similar to ion channels by forming an aqueous pore for the polar head groups of the phospholipids to cross the hydrophobic center of the membrane (Pomorski and Menon, 2006; Sanyal and Menon, 2009). 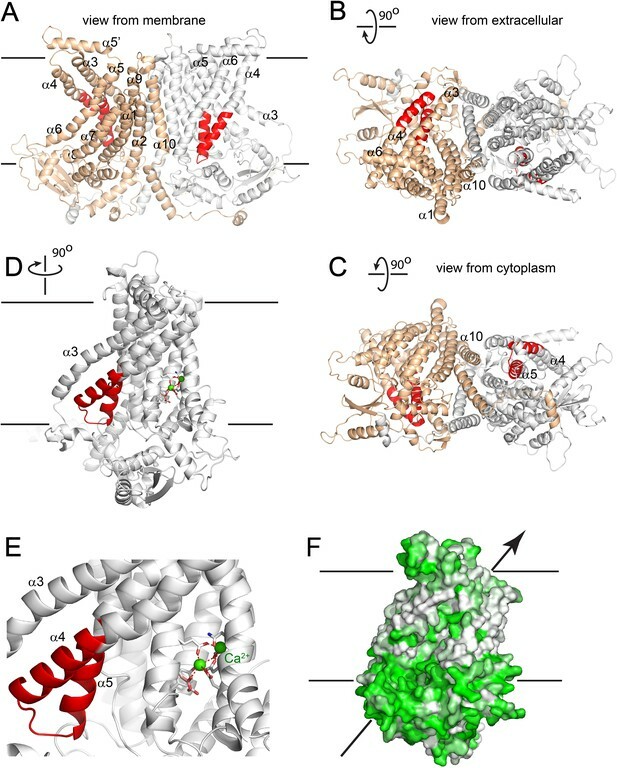 The recent 3-dimensional structure of nhTMEM16, which catalyzes PLS when incorporated into lipid vesicles, provides key insights into this process (Brunner et al., 2014). The authors noticed a peculiar hydrophilic cavity facing the hydrophobic bilayer that they propose may be involved in lipid scrambling, although no lipids were visualized in the structure. The idea that this cleft may be the phospholipid ‘channel’ is supported by our ANO6 homology model that predicts that the SCRD forms one side of this cleft. Intriguingly, residues located in TMD7-TMD8 of ANO1, identified for their roles in Ca2+ binding and gating, make up the other side of this hydrophilic cavity (Yu et al., 2012; Tien et al., 2014; Bill et al., 2015) (Figure 9D,E). The Ca2+ binding site, therefore, is well situated to control structural rearrangements of the hydrophilic cleft to provide a potential pathway for phospholipid translocation. An important role of ANO6 in PLS seems well established (Suzuki et al., 2010, 2013b), although its identity as a PLSase has been contested (Yang et al., 2012). This debate has attracted considerable attention (Harper and Poole, 2013; Kmit et al., 2013; Kunzelmann et al., 2014; Pedemonte and Galietta, 2014). It is important to note that despite the motivation to conclude that ANO6 is a PLSase based on its similarity in structure to nhTMEM16, it remains a possibility that ANO6 is a regulator of another protein that is the PLSase. Our finding that only about 92% of cells expressing ANO6 exhibit PLS suggests that ANO6 is not sufficient for PLS. Further, the lack of correlation between ANO6 expression levels and PLS activity supports some skepticism. One must only recall that PLSCR1 incorporated into liposomes mediates PLS but that knockout of its gene does not have clear-cut effects on PLS to appreciate a need for caution (Acharya et al., 2006; Fadeel and Xue, 2009; Bevers and Williamson, 2010; Ory et al., 2013). We propose that during scrambling ions pass through the same pathway that is occupied by the phospholipid. Ions might accompany the phospholipids as counterions or may simply flux independently through the same pathway. This suggestion is based on the observation that PLS and ionic currents activate contemporaneously and exhibit similar sensitivity to Ca2+. Furthermore, the presence of non-selective, slowly-activating currents that are insensitive to the ANO1 inhibitor MONNA correlate with the ability of chimeras to scramble. Some support for this idea is provided by cysteine mutagenesis and accessibility experiments showing that amino acids that we believe form the vestibule of the Cl− selective pore of ANO1 (Yu et al., 2012) are located at the extracellular surface of the hydrophilic cleft (Figure 9—figure supplement 1). Our data add to the already growing awareness that the ANO family is functionally split with some of its members being anion-selective ion channels (ANO1 and ANO2) and other members having the ability to transport lipids between membrane leaflets. This functional duplicity is reminiscent of two other anion channels, CFTR and CLCs, which apparently evolved from transporters. CFTR (cystic fibrosis transmembrane conductance regulator) is a Cl− channel that evolved from ABC transporters (Gadsby et al., 2006; Jordan et al., 2008; Miller, 2010), and the CLC chloride channels CLC-1 and CLC-2 are members of a 9-gene family most of which are H+-Cl− exchangers (Miller, 2006; Lisal and Maduke, 2008). Additionally, the P4 ATPases that function as lipid flippases evolved from a family of ion transporters (Baldridge and Graham, 2013; Lopez-Marques et al., 2014). One might speculate that the primordial ANO was a lipid transporter. During evolution, functional divergence likely occurred after gene duplication where the selective pressure for the major function (lipid transport) decreased, thus enabling the enhancement of the minor sub-function (ion transport). The finding that fungi have only one ANO gene, but that some fungal ANO homologs have PLS activity (Malvezzi et al., 2013; Brunner et al., 2014), supports the idea that PLS is an ancient function of ANOs. Our data suggest that the ionic currents carried by ANO6 are essentially flowing along with the scrambling lipids. Thus, the non-selective ion transport that occurs concomitantly with PLSase activity may have been a sub-function in the ancestral ANO. After gene duplication occurred, this sub-function may have evolved Cl− ion specificity. ANOs that have evolved into anion channels may be more Cl− selective than the scrambling ANOs simply because the energy contour of the conduction pathway is altered by the absence of lipid substrate. Because Cl− is more hydrophobic than its cationic cousins, it may be more suited to traverse the evolutionary remnants of the phospholipid pathway. Consistent with this idea is the fact that, compared to many voltage-gated cation channels, Cl− channels are sadly non-selective: virtually all anions permeate and cations are often significantly permeable (Duran et al., 2010). The pores of Cl− channels are often modeled as large viaducts that provide selectivity based largely on ionic hydration energies (Dawson et al., 1999; Qu and Hartzell, 2000; Liu et al., 2003). This low selectivity is precisely what one might expect to evolve from a transporter that previously transported phospholipids. The finding that we can convert ANO1 into a protein capable of catalyzing PLS provides further support for this hypothesis for ANO1 evolution. Like the ClC family, where a single glutamic acid residue can determine whether a protein is a H+-Cl− transporter or a Cl− channel, here we show that a few amino acids can convert ANO1 into a protein that supports PLS activity. However, we have not yet been able to convert ANO6 into a Cl− selective ion channel. It is likely that additional changes outside the SCRD are required to confer Cl− selectivity. This may be also be explained by epistasis, where evolutionary trajectories are blocked by the accumulation of neutral mutations that have no impact on the initial function (non-selective ion transport) but prevent acquisition of the new function (Cl− selectivity) (Bridgham et al., 2009; Breen et al., 2012). Yang et al. (2011) have reported that mutations of the last amino acid in the SCRD (Q559 in ANO6, K588 in ANO1) alters the ionic selectivity, but the changes are only 2–3-fold and do not shift selectivity from cation to anion. Intriguingly, the Saccharomyces ANO homolog, Ist2p, has been shown to play a role in tethering the cortical ER to the plasma membrane, but it is not known whether this protein also has PLSase or ion channel activity. However, one might speculate wildly that Ist2p may play a role in transport of lipids from the ER to the plasma membrane, because tethering of the ER to the plasma membrane is important for the proper function of non-vesicular lipid transport (Holthuis and Menon, 2014) and deletion of Ist2p along with other ER-plasma membrane tethering proteins results in aberrant phosphatidylinositol 4-phosphate levels and localization (Stefan et al., 2011; Manford et al., 2012; Wolf et al., 2012; Stefan et al., 2013). ANO1 is well established as the pore forming unit of Ca2+ activated Cl− channels (Caputo et al., 2008; Schroeder et al., 2008; Yang et al., 2008) and is incapable of rescuing PLS in cells with ANO6 disrupted (Suzuki et al., 2013b). However, our finding that the function of ANO1 can be converted by replacing a domain as small as 15 amino acids raises questions whether ANO1 might be a PLSase under appropriate conditions. Perhaps a missing subunit or regulatory enzyme could activate its PLSase activity. Alternatively, the SCRD may hold a vital interaction site for another component essential for this process or possess a key site of posttranscriptional modification required for activating this activity. In any case, it is clear that ANO1 function is intimately dependent on phospholipids (Terashima et al., 2013) and understanding the relationships of the ANOs to membrane lipids is certain to be a major research goal for many laboratories in the coming years. mANO1 (Uniprot Q8BHY3) and mANO6 (Uniprot Q6P9J9) tagged on the C-terminus with EGFP were provided by Dr Uhtaek Oh, Seoul National University. For designing chimeras, mANO1 and mANO6 were aligned using MUSCLE (McWilliam et al., 2013). Chimeras were constructed using overlap extension PCR (Pont-Kingdon, 1997). Chimeras are named X-Y-X_i-j, where X is the ANO paralog template whose amino acids numbered i-j are replaced with the aligned amino acids from ANO paralog Y. The alignment is shown in Figure 6—figure supplement 2. PCR primers were designed to engineer complementary overlapping sequences onto the junction-forming ends of PCR products that were subsequently assembled by PCR. PCR-based mutagenesis was used to generate mutations in one or a few amino acids. The protein coding region of all chimeras and mutants were sequenced. A cDNA construct consisting of Clover fluorescent protein followed by a hexa-histidine tag and lactadherin-C2 (Clover-(His)6-LactC2) in the pET-28 bacterial expression vector was a generous gift from Dr Leonid Chernomordik (NIH/NICHD). Rosetta2(DE3) BL21 Escherichia coli (Novagen, Germany) were transformed with Clover-(His)6-LactC2 in pET28, grown in TB medium at 37°C in 50 µg/ml kanamycin and 30 µg/ml chloramphenicol until the culture reached A600 = 1. After addition of 1 mM IPTG, the culture was grown for 3 hr at 28°C. Cells were lysed in B-Per (Thermo Scientific, MA) containing lysozyme, benzoase, and protease inhibitor cocktail III (Calbiochem). After centrifugation at 20,000×g 10 min, Clover-(His)6-LactC2 was purified from the supernate on a 1-ml Talon cobalt affinity column (Clontech, CA). Stock solutions of 1–3 mg/ml were stored in the elution buffer (150 mM imidazole pH 7 plus 0.02% NaN3) and were used at ∼1–3 µg/ml. where X is the cation and ΔErev is the difference between Erev with the test solution XCl and that observed with symmetrical solutions. PLS was assessed by live-cell imaging of the binding of Annexin-V conjugated to Alexa Fluor-568 (Invitrogen, CA; ‘Annexin-V’ diluted 1:200) or LactC2 fused to Clover fluorescent protein (Kay et al., 2012). PLS was measured in populations of intact HEK293 cells grown on glass coverslips mounted in Attofluor chambers (Invitrogen, CA) and imaged at ambient temperature with a Zeiss confocal microscope using a 63× Plan-Aprochromat NA 1.4 objective. PtdSer exposure was measured by binding of Annexin-V-AlexaFluor-568 (543 nm excitation; 560 nm long pass emission) or LactC2-Clover (488 nm excitation, 500–530 nm band pass emission). The bath solution contained (mM) 140 NaCl, 10 CaCl2, 10 Tris-HCl pH 7.4. PLS was stimulated by elevation of intracellular Ca2+ using the Ca2+ ionophore A23187 (10 µM). The most reproducible PLS was obtained by incubation of cells 5 min in A23187 in nominally zero-Ca2+ solution followed by washout of A23187 and addition of 5 mM Ca2+ to initiate PLS. We presume that the A23187 exposure in zero Ca2+ depletes internal stores and that the readdition of Ca2+ results in store-operated Ca2+ entry that is more rapid than Ca2+ entry through A23187 channels alone. In some experiments, PLS was stimulated by exposure to A23187 and Ca2+ simultaneously Sometimes SERCA inhibitors were included with no obvious effect. 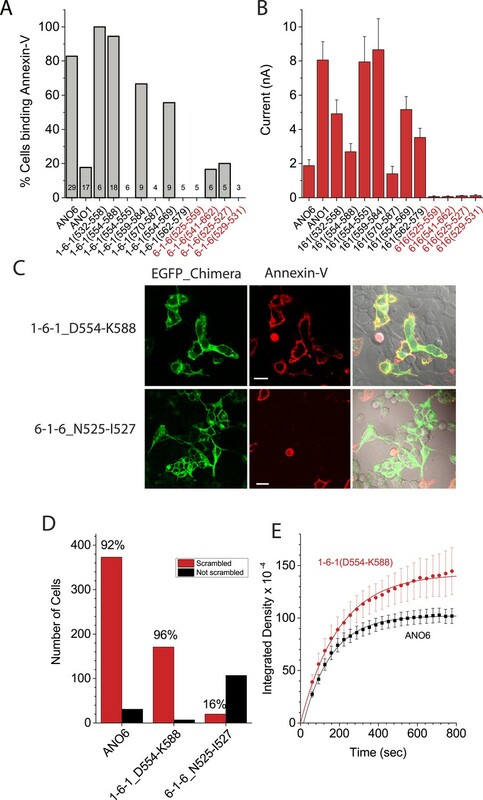 Scrambling was quantified by measuring the increase in Annexin-V fluorescence in EGFP-expressing cells by creating a binary mask from the EGFP channel for each Annexin-V-Alexa-568 frame in the time series using Fiji Image-J 1.49. The raw integrated density was then calculated by adding the intensity of all pixels in the unmasked area. Binding of Annexin-V-AlexaFluor-568 to patch-clamped cells during voltage-clamp recording was imaged with a wide-field Zeiss Axiovert 100 microscope using a 40× NA 0.6 LD-Acroplan objective. Images were acquired with an Orca-FLASH 4.0 digital CMOS camera (C11440, Hamamatsu, Japan) controlled by Metamorph 7.8 software (Molecular Devices, CA). Annexin-V-AlexaFluor-568 was added to the normal extracellular solution before patch clamping the cell. After whole-cell recording was established with an intracellular solution containing either zero, 20 μM, or 200 μM free Ca2+ the accumulation of Annexin-V on the plasma membrane was imaged at 1-min intervals synchronously with voltage clamp recording. Stable ANO6-FLAG3X cells were fixed on glass coverslips in 4% PFA for 10 min at room temperature, permeablized with 1.5% Tritonx-100 and stained with anti-FLAG M2 antibody (Sigma–Aldrich, MO) for two hours at room temperature. Coverslips were washed and stained with anti-mouse-Alexa-488 secondary and Alexa-633 conjugated phalloidin (1:1000, Molecular Probes, CA). Western blot analysis was performed on protein lysates using anti-FLAG M2 antibody and anti-GAPDH (Millipore, MA) followed by incubation with HRP conjugated anti-mouse secondary (BioRad, CA). Type-II divergence was determined using DIVERGE 3.0 (http://xungulab.com/software.html) (Gu, 2006; Gu et al., 2013). Sequences used for the DIVERGE analysis are listed in Figure 5—figure supplement 1. Sequences were curated, divergent N-terminal and C-terminal sequences were deleted, and the sequences aligned using MUSCLE. For plotting, the site-specific posterior ratios for Type II divergence were binned across a window of 15 amino acids and normalized to the maximum value. We created homology models of ANO6 based on nhTMEM16 (Brunner et al., 2014). mANO6 sequence was submitted to the Phyre2 Protein Fold Recognition Server (Kelley and Sternberg, 2009). mANO6 (truncated to 833 residues by deleting the extreme N- and C- termini) was aligned to the nhTMEM16 sequence extracted from PDB ID 4WIT (674 residues). These two sequences share 23% identity and 37.4% similarly (calculated by the BLSM62 algorithm). A total of 12 gaps were introduced, primarily at the N- and C-termini and in loops between secondary structural elements. Secondary structure prediction was incorporated into the alignment for Phyre2 (and all of the other modeling servers used for comparison including Swiss-Model and Tasser). There are no gaps in or near the SCRD, with the nearest gaps located in extracellular loops between helices 3 and 4 (2 residue gap 24 residues away) and between helices 4 and 5 (1 residue gap 22 residues away). While overall alignment and homology model generation would benefit from a template with greater sequence identity, all modeling servers reported high confidence in the generated models with no variation in the placement of the SCRD between models. Model geometry was minimized and the model subjected to 500 steps of geometry idealization and energy minimization using Phenix (Adams et al., 2010). The overall RMSD of Cα atoms in the final alignment was 1.485 Å with a Q-score of 0.667 (calculated by UCSF Chimera). Electrophysiological traces were analyzed with Clampfit 9 (Molecular Devices, CA). Fluorescence intensity was analyzed with MetaMorph 7.8 and Fiji Image-J 1.49. Data are presented as mean ± SEM. Statistical difference between means was evaluated by two-tailed t-test. Statistical significance was assumed at p < 0.05. The Journal of Cell Biology 173:69–82. The Journal of Physiology 591:3487–3505. The Journal of Biological Chemistry 284:28571–28578. Proceedings of the National Academy of Sciences of USA 110:E358–E367. Cell Biochemistry and Biophysics 46:143–154. The Journal of Biological Chemistry 271:17205–17210. The Journal of Biological Chemistry 290:889–903. Biochimica et Biophysica Acta 1486:128–144. 590–594, Science, 322, http://www.sciencemag.org/cgi/content/abstract/1163518v1, 10.1126/science.1163518. Physiological roles and diseases of TMEM16/anoctamin proteins: are they all chloride channels? Annual Review of Physiology 72:95–121. Critical Reviews in Biochemistry and Molecular Biology 44:264–277. The Journal of Biological Chemistry 276:1071–1077. The Journal of Immunology 148:2207–2216. Current Opinion in Cell Biology 22:430–436. The Journal of General Physiology 141:585–600. Molecular Biology and Evolution 23:1937–1945. Molecular Biology and Evolution 30:1713–1719. Cell Death & Disease 4:e969. The Journal of Physiology 587:2127–2139. Trends in Cell Biology 19:514–522. Biochemical and Biophysical Research Communications 414:9–13. Proceedings of the National Academy of Sciences of USA 105:18865–18870. Advances in Experimental Medicine and Biology 991:177–193. Molecular Biology of the Cell 23:2198–2212. Cell Death & Disease 4:e611. Molecular functions of anoctamin 6 (TMEM16F): a chloride channel, cation channel, or phospholipid scramblase? Journal of Thrombosis and Haemostasis 9:1883–1891. Nature Structural & Molecular Biology 15:805–810. CFTR: what's it like inside the pore? Journal of Experimental Zoology. Part A, Comparative Experimental Biology 300:69–75. Proceedings of the National Academy of Sciences of USA 108:18168–18172. Proceedings of the National Academy of Sciences of USA 107:959–960. The Journal of Neuroscience 33:3545–3556. The Journal of Cell Biology 180:1005–1019. Journal of Cell Science 128:2021–2032. Journal of Molecular Biology 427:94–105. Cellular and Molecular Life Sciences 63:2908–2921. Methods in Molecular Biology 67:167–172. Molecular Biology of the Cell 25:1793–1807. Archives of Biochemistry and Biophysics 462:103–114. Flipping lipids: why an' what's the reason for? American Journal of Physiology. Cell Physiology 304:C748–C759. Annual Review of Biophysics 37:175–195. The Journal of Biological Chemistry 288:13305–13316. The Journal of Biological Chemistry 289:30257–30267. Cellular Physiology and Biochemistry 30:1319–1332. Proceedings of the National Academy of Sciences of USA 110:19354–19359. Cold Spring Harbor Perspectives in Biology 3:a004671. The Journal of Experimental Medicine 182:1597–1601. Proceedings of the National Academy of Sciences of USA 108:8891–8896. The Journal of Cell Biology 202:875–886. The Journal of General Physiology 143:253–267. Biochimica et Biophysica Acta 1376:433–453. Thank you for sending your work entitled “Identification of a lipid scrambling domain in ANO6/TMEM16F” for consideration at eLife. Your article has been favorably evaluated by Randy Schekman (Senior editor and Reviewing editor) and three outside reviewers. The following individual responsible for the peer review of your submission have agreed to reveal their identity: Todd Graham and Anant Menon (peer reviewers). A further reviewer remains anonymous. 1) The authors should improve the annexin quantification and the correlation of its response with ANO6 expression. 2) The lag time between the ionic current and annexin binding can be explained by the non-linear response of annexin to PS density. A few experiments with Lactadherin, whose response to PS is more linear, could strengthen this part and validate the hypothesis that the ionic current is a consequence of the scramblase activity, not the other way round. 3) In the present state, the lipid docking predictions are not detailed enough to be convincing. The authors should provide more information or delete all this part. 4) In general, the paper would benefit from a major re-write to reduce jargon, and to state the problem and results clearly. Referencing would also benefit from a better appreciation of the lipid scrambling field. There are also many other issues that you could address but the four above are the main ones that the reviewers consider essential. There are conflicting reports on whether ANO6/TMEM16F is a Ca2+-activated ion channel, a Ca2+-activated phospholipid scramblase, or both. There is also significant discrepancy in the literature on the ion selectivity of ANO6, and assuming it can directly scramble phospholipid, there is no clear understanding of how ANO6 mediates phospholipid transport while the closely related ANO1 clearly lacks scramblase activity. The submitted manuscript provides evidence that ANO6 primarily functions as a phospholipid scramblase and that ion permeation through the channel is a consequence of phospholipid translocation. Part of the significance of this work is that it potentially clarifies the relationship between the ion channel and scramblase activities of ANO6. A second, major point of significance is that the authors help define the mechanism of phospholipid scrambling by mapping the region of the TM domain that is responsible for this activity. By transplanting a small section of the 4th and 5th transmembrane segments of ANO6 into ANO1, they conferred upon ANO1 the ability to induce Ca2+-dependent phospholipid scrambling in transfected cells. Within a homology model, this region maps to a hydrophilic cleft in the membrane domain that appears to be the ion permeation route in ANO1, but can be molded into a phospholipid transporter by exchange of a few amino acids. These observations provide the first mechanistic insight into how substrate specificity of the ANO/TMEM16 family of proteins is determined. There are a few weaknesses in the presentation of the data that modestly detracts from my enthusiasm for the work. 1) A trivial explanation for the difference in scramblase activity for GFP-ANO1 and GFP-ANO6 shown in Figure 1 could be differences in the level of expression. Assuming the images were acquired with the same exposure settings, the authors could and should comment on the relative expression levels of their constructs. 2) For Figure 2, it seems odd to me that the transfected ANO1 or ANO6 confer the major currents in the plasma membrane of the HEK cells. What kind of currents do untransfected cells display in these patch clamp experiments? Have these currents been measured and subtracted from the transfected cell data? Phosphatidylserine (PS) is also carrying charge across the membrane and the authors should indicate whether or not this contributes to the current they are measuring. 3) There is a tremendous amount of data squeezed into Figure 5 and the impact/importance of the observations is somewhat obscured because of the complexity and density of information. In addition, the qualitative and more subjective nature of the “% scrambled cells” measure used in Figure 5B and “yes/no” for scrambling activity in the table was unsatisfying because it is unclear how well the 1-6-1 chimeras have recapitulated the Ca2+-activated scramblase activity of ANO6. My primary recommendation is that the authors take their best 1-6-1 chimera carrying the SCRD and their best 6-1-6 chimera which loses SCR activity and perform the more quantitative kinetic assay as shown in Figure 2A and B. These data should be included in either Figure 5 or Figure 6. 4) The molecular docking of PS to the modeled structure in Figure 8D and E is premature and should be removed. I don't think anyone has addressed the phospholipid specificity of ANO6 and I wouldn't expect a strong and specific binding site for PS in the membrane domain that mediates scrambling. My suggestion to the authors is to simply display the homology model and delete the description of their attempts to dock PS. Nothing meaningful was gained by this approach and the description seemed to detract from the presentation. One doesn't need this result to speculate on the translocation pathway in the Discussion section. I would prefer to see a zoomed in view of the SCRD in relationship to the proposed Ca2+-binding site for Figure 8E. The exposure of PtdSer on the external leaflet of the PM by phospholipid scrambling occurs in several biological processes and is an important cellular signaling mechanism. However, there is a great uncertainty about the identity of the phospholipid scramblases involved in such processes. This manuscript focuses on the lipid scrambling activity of ANO6/TMEM16F (hereafter ANO6), which has been proposed to be a Ca2+-activated scramblase. Yet, it has also been suggested that ANO6 is required for lipid scrambling by forming an ion channel but not by performing the scrambling activity itself. This manuscript convincingly shows that ANO6 is a ‘true’ scramblase and also indicates that the recorded ion channel activity of ANO6 is a consequence (a leak current) of phospholipid scrambling. In an elegant and very detailed manner the authors identify a minimal region in ANO6 required for PS scrambling. This is an excellent study. 1) Experiments include real-time monitoring of ion currents by patch clamp, and phospholipid scrambling using Annexin-V as indicator of exposed PtdSer. The authors find that ANO6 current is non-selective and allows passage of large ions such as NMDG+. The model concludes that ANO6 non-selective ion current coincides with phospholipid scrambling. Annexin-V has been widely used as a probe for exposed PtdSer, but Annexin-V response to PtdSer is not linear and requires a certain threshold of PtdSer to bind. Therefore, this probe is not well adapted for correlative real-time assays such as presented in Figure 2. Notably, Annexin-V signal appears 3 min after the increase in current amplitude. This lag is commented in the text and the hypothesis raised by the authors is reasonable. However, is it possible to do the same experiment using a more robust PtdSer probe such as Lactadherin? Advantages of Lactadherin over Annexin-V have been listed in Shi J et al. 2006, a paper also cited by the authors. 2) The authors performed extensive sequence swapping studies to define the so-called scrambling domain (SCRD) in ANO6, which can confer the scrambling activity to ANO1. Mutations in SCRD prevented ANO6 from performing PtdSer scrambling. The manuscript presents a homology model of ANO6 based on the X-ray structure of nhTMEM16 to position SCRD. However, to assess the reliability of the model it is important to know the identity percentage between the two sequences and whether or not sequence gaps were introduced for sequence alignment. It is stated in the text that 1-palmitoyl-2-stearoyl-sn-glycero-3-(phospho-L-serine) has been used for docking prediction, but apparently only the polar heads of PtdSer are represented in Figure 8. This should be stated in the text. Why are the acyl chains absent from the docking model? It is unclear from the model whether the SCRD interacts physically with PtdSer polar head. The paper sets up the problem in an artificial way, possibly reflecting the chronology of the authors' approach to the problem, but not relevant to a general readership: there is no question that members of the TMEM16 family are phospholipid scramblases based on the reconstitution and detailed testing of two fungal TMEM16s (afTMEM16 and nhTMEM16). The question being addressed is whether TMEM16F/ANO6 is a scramblase. This is important, as ANO6 is the ‘Scott syndrome’ protein whose functional deficiency prevents PS exposure on activated blood platelets resulting in a bleeding disorder. The ensuing studies of ANO6, and chimeric constructs comprising ANO6 sequences inserted into the non-scrambling ANO1, are very informative and this is what the authors should focus on. The most important conclusion of the paper stems from the demonstration that a 15-amino acid stretch of ANO6, when transplanted into a comparable region of the ANO1 ion channel, confers phospholipid scramblase activity onto ANO1. Molecular modeling shows that this region falls within a membrane-facing hydrophilic groove defined by a recent crystal structure of a fungal TMEM16 homolog. This groove was suggested to be the lipid transport pathway, and the present data support this suggestion. The idea that ions ride along with phospholipids, or leak through the phospholipid pathway, is plausible but not completely firm. However, it seems to be the best that the authors can do with their experimental system. 1) The method of quantification of annexin binding is not explicitly described; as all conclusions about scrambling rest on this read-out, the method by which the graph shown in Figure 1C was generated needs to be described in detail. 2) The result of experiments without included caspase inhibitor should be shown in Figure 1C. How was it verified that the caspase inhibitor worked? 3) Does the rate at which the Annexin signal is generated increase with the level of expression of ANO6 in the transient transfections? Or is the Annexin readout rate-limiting? This again demands details of quantification: what is the cell-to-cell variation in lag time and rate of signal increase in panel C? 4) The experiments in Figure 2 show that Ca2+, delivered by patch pipette, can promote currents and PS exposure (annexin binding). In panel C, how was F/Fo measured reliably as Fo would be ∼0 for the ANO1 case, and nowhere is it stated what time point was used to take Fo for the ANO6 case. 5) Figure 2: What is the explanation for the decrease in I/Imax for ANO1 vs. the increase in ANO6? 6) In the subsection headed “Is ANO1 a broken transporter?”: The Saccharomyces TMEM16 homolog has no detectable function; it does not transport ions or scramble lipids as per Malvezzi et al. (2013) and acts as a linker between the ER and PM (Manford et al. Dev Cell 2012). How does this fit the argument of ancient function of ANO proteins? 7) In the subsection headed “The ion conduction pathway”: The pathway for chloride in ANO1 requires amino acids located on the outside of the hydrophilic cleft, so how can it be started that this is an evolutionary remnant of the phospholipid pathway? 8) Figure 8: The SCRD is surprisingly asymmetric with respect to the membrane, lying mainly within the cytoplasmic leaflet. The authors offer no discussion about how this would offer a path for bidirectional movement of phospholipids. 9) The docking exercise was only performed with PS; however the fungal TMEM16 scramblases and the known activity of platelets and red blood cells move all phospholipids. What is the energetics of transport or PC? Or other major phospholipids? We have added extensive quantitative analysis of both Annexin-V binding and LactC2 binding as a measure of phospholipid scrambling (PLS). In response to this and other reviewers’ comments, Figures 1 and 2 have been completely reconfigured. Figure 1 now shows LactC2 binding. We quantify the percentage of cells that exhibit PLS, the expression of ANO1 and ANO6 by western blot, and the time course of LactC2 binding compared to AnnexinV binding. Figure 2 now quantifies AnnexinV binding relative to ANO6 expression and shows the time course of AnnexinV binding. Quantification has also been enhanced in Figure 6 (old Figure 5). Whereas previously we scored different chimeras as positive or negative for scrambling, we now provide the percentage of cells that scrambled. Figure 7 (old Figure 6) now includes plots of the percentage of cells that scramble and the time course of scrambling in one of the representative chimeras. New Figure 7–figure supplement 1 quantifies the ionic currents and PLS in two representative chimeras, one that scrambles and one that does not scramble. Figure 1 has been added to show scrambling experiments using lactadherin. We have quantified the percentage of cells scrambled and the time course, which is considerably slower than that of Annexin-V. Because the time course of LactC2 is slow, we have used Annexin for most of the experiments in the paper. The docking data have been deleted and Figure 8 (the homology model) has been modified to show additional views of the SCRD. We have tried to edit the manuscript to make it more readable and to cite the scrambling literature more extensively. The paper has been essentially completely re-written to address the reviewers’ comments. The expression levels of ANO6 were typically somewhat lower than ANO1 as judged both by immunofluorescence and by western blots. Western data has been added to Figure 1. We have previously published data showing that the currents in untransfected HEK cells under these conditions are negligible. For example, see online Figure 1 in Yu et al. 2012 (PMID 22394518). The currents are small partly because the ionic conditions are chosen to eliminate K+ currents and HEK cells have no Na+ or Ca2+ currents. Under these conditions, background Cl- currents are small. Figure 5 and Figure 6 (new Figures 6 and 7) have been reorganized for a more clear presentation and a considerable amount of new data have been added on quantification as indicated above. We have provided numbers of percentage of scrambled cells for the chimeras (instead of yes/no) and have expanded our characterization of the two best chimeras, as the reviewer suggests. We agree with the reviewer that the PS scramblase domain likely does not have a high affinity specific PS binding site. We have removed Figure 8D and replaced it with a view highlighting the SCRD and the location of the conserved Ca2+ binding site. We have also generated a zoomed in view of the SCRD and Ca2+ site to replace Figure 8E. Lactadherin experiments have been added as Figure 1. ANO6 (833 residues) was aligned to the TMEM16 sequence extracted from PDB ID 4wit (674 residues). These two sequences share 23% identity and 37.4% similarly (calculated by the BLSM62 algorithm). A total of 12 gaps were introduced, primarily at the N- and C-termini and in loops between secondary structural elements. Secondary structure prediction was incorporated into the alignment for Phyre2 (and all of the other modeling servers used for comparison including Swiss-Model and Tasser). There are no gaps in or near the SCRD, with nearest gaps located in extracellular loops between helices 3 and 4 (2 residue gap 24 residues away) and between helices 4 and 5 (1 residue gap 22 residues away). While overall alignment and homology model generation would benefit from a template with greater sequence identity, all modeling servers reported high confidence in the generated models with no variation in the placement of the SCRD between models. The PtdSer docking has been deleted. I am not sure I understand the full import of this comment. I interpret it to mean that the reviewer feels that the relationship of the ANO6 current is less important or interesting than the chimeric constructs. I tend to disagree, because there remains considerable uncertainty in the literature about the nature of the ANO6 current. I agree fully with the reviewer’s comments. In some ways, this idea is not completely compelling, but yet it does fit the data that we have. We have expanded our quantification extensively and have described our methods in detail. Figure 1 and 2 have been replaced with new data and the caspase inhibitor data have been removed. We feel that the caspase inhibitor is a side-issue and that it is not necessary for this paper to address the question whether caspase is required for ANO6 scrambling. We have expanded our quantification extensively as noted above. 4) The experiments in Figure 2 show that Ca2+, delivered by patch pipette, can promote currents and PS exposure (annexin binding). In panel C, how was F/ Fo measured reliably as Fo would be ∼0 for the ANO1 case, and nowhere is it stated what time point was used to take Fo for the ANO6 case. F/Fo fluctuated around 1 (not zero) for ANO1. Fo for ANO6 was taken immediately upon establishing whole-cell recording. This has been added to the figure legend. We have previously published details of the Ca2+-dependent rundown of the ANO1 current. The reference to these data of Yu et al. (2014) is cited in the text. The mechanism of this remains unknown. I am not sure I understand this question. The amino acids we identify are predicted to be at the extracellular surface of the protein and form the extracellular entryway into the conduction pore, which we think may coincide in part with the hydrophilic cleft. Obviously, there are many questions we cannot answer with the data available. Certainly, there is the likelihood that other parts of the protein or accessory proteins may play additional roles, but at this point in time we have little insight into this question. Supported by NIH grants GM60448-12 and EY114852-11 to HCH. Jarred Whitlock was supported by an NIH Training Grant 5T32GM008367-25. This research project was supported in part by the Emory University Integrated Cellular Imaging Microscopy Core. © 2015, Yu et al.